He is survived by his wife Jill of the home; his daughter, Laura (and John Pierre) Lukens of Avenel, New Jersey; adopted son, Shawn (and Lindsay) Patrick of Greenwood, Missouri; three grandchildren, Francis Pierre and Mariella Pierre both of Avenel, and Ridge Patrick of Greenwood; three sisters, Sarah Martino of Colorado Springs, Colorado, Mary (and Dave) Owen of Independence, Missouri, and Judith (and John) Galen of Ponte Verde, Florida; several nieces and nephews; other relatives and friends. A Memorial Service was held Monday, January 21, 2019, at the Stanley-Dickey Funeral Home, Pleasant Hill, Missouri. Father Curt Vogel will officiate. To plant a tree in memory of Charles Eugene "Charlie" Lukens, please visit our Tribute Store. 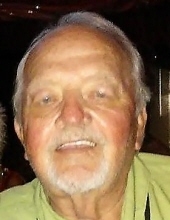 "Email Address" would like to share the life celebration of Charles Eugene "Charlie" Lukens. Click on the "link" to go to share a favorite memory or leave a condolence message for the family.